Tuesday night, my 10 year old daughter and her school softball team competed in the district championship. They lost. By one run. That day was “Field Day” at school. The sun was out, it was hot and humid, and they ran obstacle courses for most of the morning and afternoon. By the time they got on the softball field at 6:30, they were tired. Not to mention, out of the 10 girls on the team, one was out with a head injury and another (who played so we wouldn’t have to forfeit) had recently stepped on some nails. She played right through her pain. Possibly because my husband told her to “gnaw her foot off if she had to”. He's a charmer, my guy. These girls gave it all they had. All the hard work and determination paid off, but not quite as much as they would have liked. After they accepted their second place trophy and watched as the first place team celebrated, the tears began to flow. But, my daughter didn’t cry. Not a drop. As a matter of fact, she was smiling and laughing…and happy. She was completely and totally proud of herself and her team, and she had every right to be. It's good to know that her successful softball season didn't keep her head from being in the clouds. Friday afternoon, I picked up my daughter at school, ran home to pick up the puppy, took her to the vet (then took her back home after her appointment), then quickly got my son and his gear together and drove him to t-ball practice. Also, what else is new? This is why I sometimes forget to breathe. After practice, the kids and I stopped by a carry-out for some Corona milk then drove home to make a quick pit-stop before heading out to a cookout. On the way home I gave everyone jobs so that we could get to our friends' house on time, because I knew they were waiting on us. I told my son, "Your jobs are to take off your cleats, put your socks down the laundry chute, go to the bathroom, wash your hands and grab your Crocs." Then I looked in the rear view mirror at my daughter and said, "You let both dogs out and feed them." She nodded then asked, "What are your jobs?" I replied, "I'm going to give the puppy her medicine, give your brother his medicine, and I need to touch up my makeup." My daughter questioned me, "Makeup? Why do you need to do that?" I tried to reassure her that I wouldn't be cutting into her play time. "I just need to touch up under my eyes." "Oh. I can understand that." I sarcastically replied, "Gee, thanks!" "No, Mom. Just because you don't get enough sleep and you always look so tired." "Wait. I mean, everyone needs eye makeup, but especially you." My daughter. The girl can dig herself in a hole and she doesn't even need a shovel. Last night, my ten year old daughter played in the first round of softball playoffs for her spring league (regular season champions, thankyouverymuch). Even though she worked on homework from the time she got home from school until the time we left for the game, she still had a bundle of it left to finish after her shower. Because her teacher allows it and because it was almost 9:30 PM, while she completed her math, I worked on typing a report for her. I didn't change her writing, no matter how much it killed me not to. I typed that paper word for word. Okay, okay...there was one exception. Her report on slave turned activist, Sojourner Truth, had facts...I'll give her that, but I'm pretty sure she took a little liberty with the sentence, "I think Sojourner Truth had a great sense of humor". Yesterday was supposed to be a laid back day around here. No softball, no soccer, no therapy, no appointments. Plus, my son was home sick so I didn't even have to go to work. I have now come to realize that there is no such thing as a laid back day. ...it pays to have long limbs, even if that means you once had a high school teacher who nicknamed you orangutan arms. Hypothetically. Because, yesterday I was able to steer my car and hold a bag under the chin of my vomiting son who was sitting on the passenger side of the back seat. ...if you try to read a book with a seven year old around, it is like brushing your teeth with one individual toothbrush bristle. You'll get the job done, but it's going to take awhile. ...if your son sees you allowing the dogs to bite a few kernels of corn off a cob which you are holding tightly in your hand, he will take the corn cob he is supposed to be eating, throw it to the ground and let the dogs take turns biting off chunks big enough to cause intestinal blockage in an elephant. Then he'll sit back and watch as the dogs swallow them whole. ...when you attempt to pour spoonfuls of hydrogen peroxide down your dog's throat to induce vomiting, she really won't like you very much. ...when your son is peeing and completely misses the toilet, it's not necessarily because his aim is bad. It could be that his sister is standing at the sink and he's trying to pee on her shoe. ...even though the drinks at the circus cost $8.00, go ahead and splurge for more than one so you don't have to share a straw. Especially if your son has an upper respiratory infection. And, you have asthma. Unless, of course, you think breathing is overrated. Tell me boys and girls...how did yesterday treat you? Today is Grandparent's Day at my kids' school. Of course, my son is sick which means he'll be missing this valuable opportunity to entertain the masses. So, for your listening pleasure, here is seven seconds of him singing for you, as he did for anyone who would listen while we were out running errands on Friday. This includes everyone at my husband's office, random people on the playground and every employee at LensCrafters. And, if anyone from our county agency is watching, maybe we can end our 11 month-long battle about whether or not my son needs speech therapy. 1. If you have two dogs, and two kids who often clog the toilet, you're going to be dealing with a lot of poop. 2. I cried yesterday because a little boy was nice to my son. Never underestimate the power of teaching your child to be a good friend. 3. 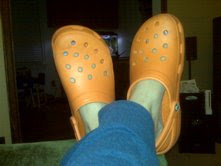 I like to wear my size 11, orange Crocs...mostly just to embarrass my daughter, who calls them my "clown shoes". 4. Insomnia is slowly killing me. 5. The LOST season finale was Wednesday night and I am kind of freaking out about what I'm going to do when the series ends next year. 6. Freaking out about a TV show going off the air is pretty sad. 7. I am reading an advance copy of "Rage Against the Meshugenah". A raw look at male depression by Danny Evans from Dad Gone Mad. A book which made me laugh AND cry in the prologue. 8. You should buy that book. 9. A puppy with a UTI is really hard to housetrain. 10. Dogs will take any pill as long as it's wrapped in cheese. 12. My husband works really hard and very long hours. 13. I miss my husband. 14. I will be 38 in a couple of weeks and realized I have been telling people that I'm 38 for the last year. 15. I love my little blog. I often talk about how far my son has come and how tenacious he is. Sometimes I am blown away by how many things from which he has bounced back. But, he isn't the only person I know who has managed to succeed when faced with insurmountable struggles. My cousin, Shrevie, has been through some very hard times. When he was just a kid, Shrevie got kicked in the head by a mule. I don't remember it, because Shrevie is quite a bit older than me, but I've heard the story a million times. For some reason, he was trying to braid the mule's tail when it reared up and kicked him right in the forehead. Shrevie was knocked unconscious. He awoke two days later with crossed eyes and a lisp. Because the kids teased him, Shrevie took to sports to prove himself. He started out as the team manager, fetching water and towels for the high school kids. When they finally gave him a chance, Shrevie gave it his all as a kicker. Despite his crossed eyes, he managed to punt the ball 20 yards! Unfortunately, that wasn't good enough for Ohio State, where he dreamed of going to college. But, as luck would have it, Texas was quite interested. Ironically, because so many children in Texas get kicked in the head by mules, Shrevie wasn't the only one on the team who sometimes ran the wrong way down the field. This is me and Shrevie back in the day...just before he left for school. Just look at how happy he was. Someone had just given him a Member's Only jacket. Shrevie is married with kids now. He unfortunately took another hit to his eye in what he refers to as Pea-Shootpalooza, but he is doing well. He left Texas years ago and is trying to find his way back to Ohio. No one has the heart to tell him that our fine state isn't in the Mid-Atlantic, but we feel confident he'll make it home someday. Oh, and this post? Is nothing but a big, fat, cross-eyed joke on NukeDad. NukeDad, you've been blunked. Here, let me break that down for you...that's blog punked. Even if you're my hero, you are still due some paybacks. And apparently, I'm not the only one who thinks you needed this. Seven years ago today, I gave birth to my son. He was born seven weeks early because his heart defect was worsening in utero. The hospital where he was born was not equipped to handle his heart problems, and our local Children's Hospital was not equipped to have me deliver him there. So, while I was in recovery following my c-section, a transport team came and took him from me. I spent about 30 seconds looking at him before he was whisked away and taken across town. In 2002, May 10th fell on a Friday. On Sunday, the hospital where I was recovering allowed me to leave so I could go see my son. It was Mother's Day. Mother's Day was the first time I stroked my son's soft hair, the first time I held his fingers in mine and the first time I ever held him in my arms. I have done those things thousands of times since then, but I will never forget our first Mother's Day together. This year, my special day and his birthday fell on he same day. We had breakfast in bed together, we both opened gifts and got cards. Then, I stroked his hair, I held his hand and I held him in my arms. I did all the things I did with him seven years ago, but now he's bigger and stronger and he's shown that heart defect who's boss. I have watched that sick, small child grow into a great kid. I am writing this late, after he's gone to bed. I don't know if there will ever be a Mother's Day as special as that first one we shared, but today came pretty darn close. Happy Birthday, Buddy. Your Mom loves you lots. A couple of years ago I was at a restaurant with my friend, Bean, enjoying some cold beer and an order of spinach and artichoke dip when our waitress came by the table to see how we were doing. She stayed to chat for a few minutes. After she walked away, Bean looked at me and said, "You have some spinach in your teeth." "You have some spinach in your teeth." I had not taken a bite since before our server stopped by. "Seriously? You mean, it was there the whole time we were talking to her?" Bean replied, "Well, I didn't want to say anything in front of her. Maybe she didn't notice." "Right! Because all that laughing and smiling was completely hiding my teeth!" Night before last, I went to happy hour with my husband and some of his employees. There was a woman sitting directly across from me whom I had never met. Because she could apparently sense how boring I am, she ordered a shot of tequila as soon as I sat down. After she had finished, I noticed a bit of salt was left on her cheek. Bean went and traumatized me, so I couldn't take my eyes off of the salt and I felt like I had to tell her. After a few seconds, I leaned across the table and discreetly said, "You have a little something on your cheek." She thanked me and we went about our evening. I sat next to my husband's boss and talked for about an hour before leaving. And wouldn't you know that when I arrived at home I looked in my bathroom mirror to find a lovely chunk of fried mozzarella stuck to my chin? My son was on the phone with my Mom, who he calls Vo-Vo (it's Portuguese for grandma), when suddenly he blurted out, "Hey Vo-Vo! You know the biggest book in your house? Well, I love you all the pages in that book!" Apparently, he thought up a new version of his "I love you to infinity game". I smiled as he listened to her then he said, "Uh-huh. Uh-huh. Yeah. Well, I love you 10,000 miles." I looked over at my little guy, fresh from a bath, all cozy on the couch in his Mario pajamas and I started to get teary. He looked so perfect and sweet, holding the phone to his ear and it melted my heart to hear him talking to my Mom like that. Again, he took in her reply, "Oh! Uh-huh. Well, I love you all the way into space in a rocket ship." He listened again as she tried to top him and I should have known the heart-melting wouldn't last. Because he then grew tired of his own game when he let out a big sigh then said, "You know what? I think we tied." It is every parent's hope and dream that their children will turn out better than they did. We wish for better opportunities, less stress and more intelligence for our offspring. When I play with our new puppy, Daisy, I get down on the floor and talk in puppy language. I say things like, "Let me rub that super-duper, pupper-wupper, Buddha, frog belly and those oogley-googley ears!" Yesterday, my ten year old daughter was romping on the floor with Daisy when I heard her say, "Daisy! How in the world can you be holding me down when you don't even have opposable thumbs?" If our puppy talk is any indication, this kid already has me beat in the intelligence department. Yesterday at school, my son exhibited some peculiar behavior when he wouldn't stop following the principal around. At one point, she came to the second grade classroom where I work to see if I could help, but once my son saw me coming, he turned and went straight to his class. All this? Is not because he has special needs. It is because he's trying to be funny. When he first started playing the "Me and My Shadow" game, with my boss, I heard her laugh as he was silently standing before her and she asked, "What in the world are you doing?" That was all he needed. One little chuckle and that comic's bread was slathered with butter. I was trying to explain this to some parents at soccer practice last night. They both know my son, but neither of them had recognized that he does some strange stuff in an attempt to be funny. A short time later we looked over to the field where my son was playing goalie during a scrimmage. There were 20 kids waiting for him to kick the ball out to the middle so play could resume. A typical kid would have seen an eager mob, jumping up and down and yelling, "Kick it! Kick the ball!" My son saw a captive audience. Instead of kicking the ball to his teammates, he slowly walked around to the other side and kicked it into his own goal. The one he was supposed to be protecting. I turned to the dad I had just been talking to and asked, "See? You see what I mean? He thinks he's being funny." He replied, "Well...he kind of is." He might as well have pulled a butter knife out of his pocket.